This chapter is for use with Word 97 - Word 2019/365. Unlike many of the other chapters, it is not a collaboration but the work of a single author without peer review. Big Idea #3 - If You Want Outline Numbering or Even Different Levels of Lists stay away from the buttons! Big Idea #7 - Do Not Destroy Your Work Using the Master Documents "Feature"
You want to use a paragraph style that has an outline level set. You could apply this outline level formatting through direct paragraph formatting, but why would you want to? This is what styles are for! The Built-In Heading styles already have outline levels assigned. They also have special properties that make other Word features work better. The first three levels even have built-in keyboard shortcuts (Ctrl+Alt+1, Ctrl+Alt+2, Ctrl+Alt+3). You can even have shortcuts for all nine levels if you want. You can modify these styles to have any appearance you want. This is the only known method of creating multi-level numbering/outlining/bullets that survives editing. Outline View has been available since at least Word 97 and continues in the Ribbon Versions of Word. It not only changes the view but gives quick access to Outlining controls. 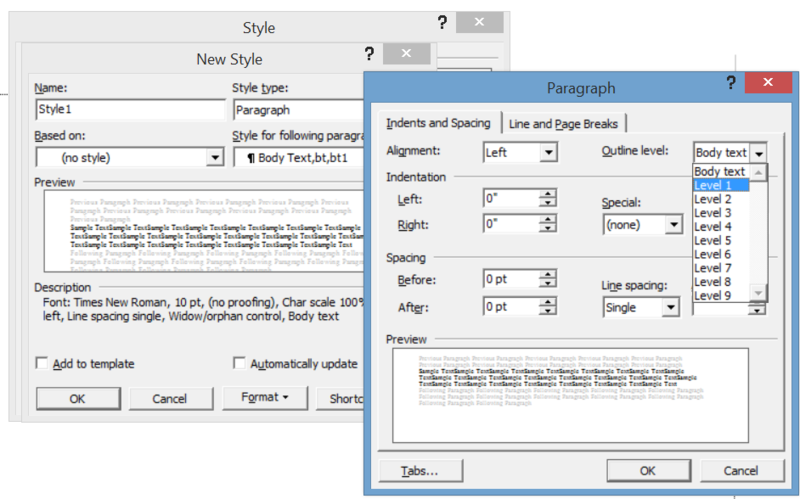 These allow collapsing Outline levels, promoting and demoting paragraphs and other helpful methods. Leave the Master Document controls alone! In Word 97-2003, you can access it under the View Menu, in later versions, under the View Tab. Once you click on Outline View, you are taken to the Outlining Tab. Outline view lets you Collapse/Expand parts of your document quickly. You can select and copy/move entire parts of your document within Outline view. You can print just the outline (collapsed/expanded as wished) by using the Quick Print button (Word 97-2003). For later versions of Word, you will need to add the button to the Quick Access Toolbar (QAT) as outlined by Suzanne Barnhill in this Answers Thread. If you use the method set forth so well by Shauna Kelly of linking your numbering to styles, that works well with the Outline View. Changing levels will also change your style. 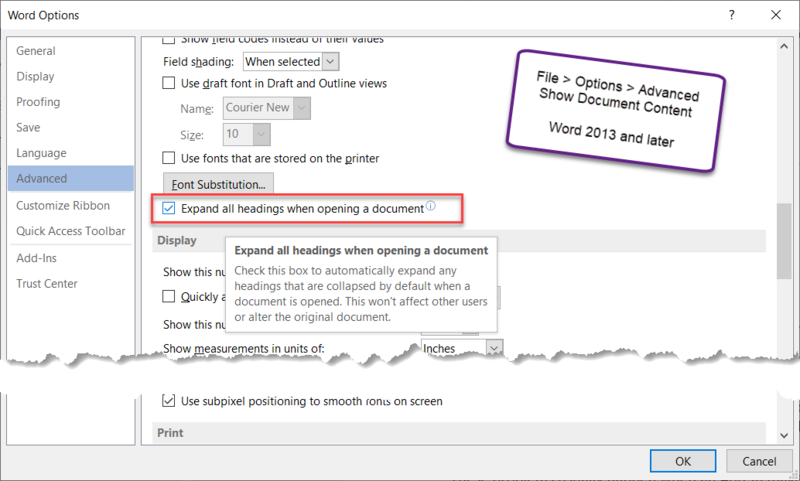 Warning: The Outline View in versions of Word after Word 97 has given access to the "Master Document features" of Word. These are dangerous and can destroy your work. See Master Documents before touching these "features." See also: How to Save Yourself Hours by Using Outline View Properly by Dave Rado, MVP. Word 2010 introduced the Navigation Pane. Documents organized using Outline-Level headings and structure can be viewed and manipulated. Do not confuse this with the Document Map in earlier versions of Word, which should not be used. 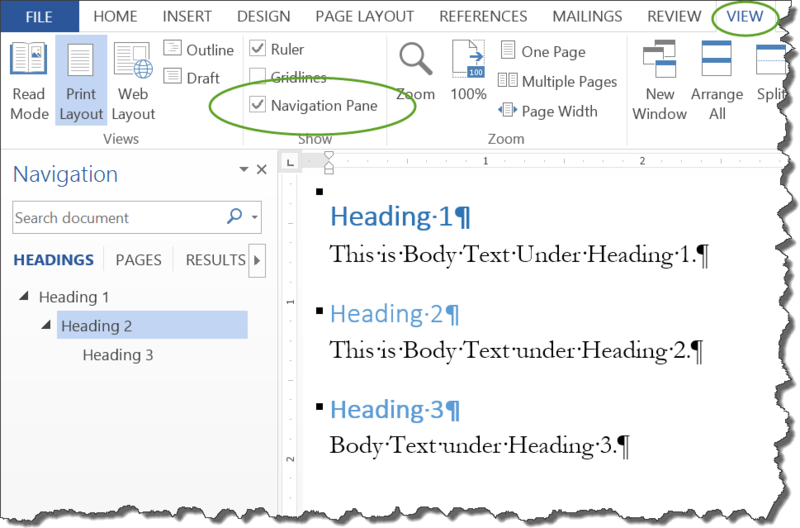 See also: Navigation Pane in Word 2010 and later. 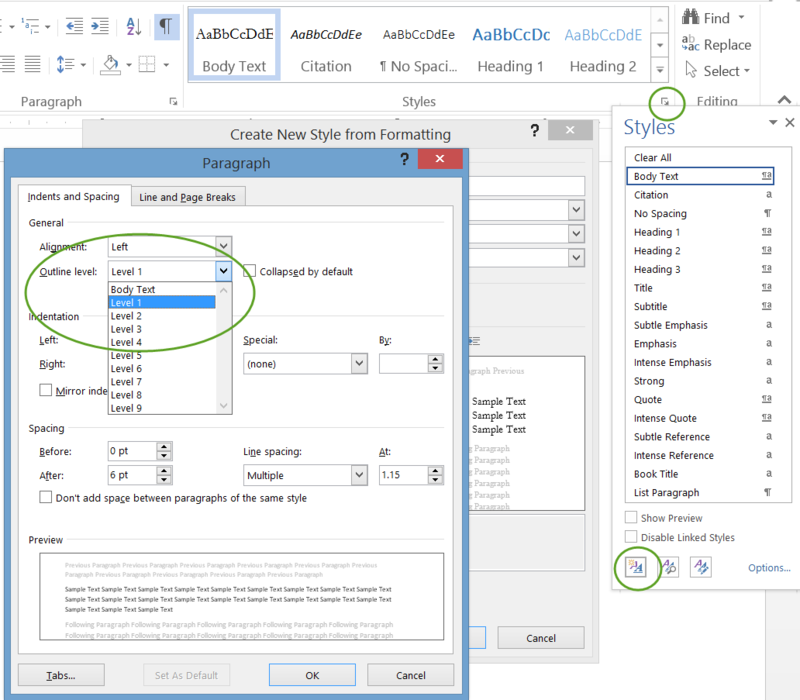 Word 2013 introduced the ability to collapse text under headings, actually under any paragraph with an outline level set in the paragraph formatting. If your mouse pointer over any paragraph that has an outline level set, you will see a little triangle, either pointed to the right or angled down. That triangle appears in the left margin next to the paragraph. The appearance of the triangle is different in different versions of Word. The screenshot below is from Word 2019. When you collapse a heading, Word hides the text following the heading paragraph until the next heading paragraph of the same or higher outline level. This will mean the rest of a document if there are no paragraphs in the appropriate outline level to stop the collapse. The triangle showing collapsed text will show on the screen always. The one to collapse text shows when you hover the mouse pointer over the paragraph. In the document shown the mouse pointer is over Heading 1, you still see the triangle indicating collapsed text in the first Heading 2, the second Heading 2 is not collapsed and does not show a triangle. When you print a document that has text collapsed, the text collapsed is not printed. The little triangle indicating collapsed text is also not printed. The text is still there in the document. Links and Cross-References to that text will still work and using them will uncollapse the text. If you convert to PDF, it will also not be printed. The Navigation Pane and Collapsing Text in the Body are Independent. 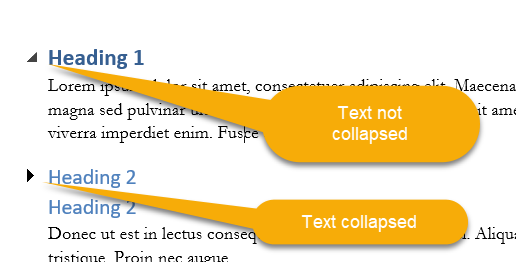 If you collapse text in your document at level 2 and there is text set to outline level 3 or lower in the collapsed area, it will still show up in the Navigation Pane. Likewise, if certain levels are collapsed in the Navigation Pane, it has no influence over what shows up in the document. If you click on a heading shown in the Navigation Pane that is in a collapsed area of text, it will uncollapse the area. Clicking on either Heading 3 or Heading 4 in the Navigation Pane will uncollapse everything that is collapsed under that Heading 2 in the document text. You can collapse your view of headings in the Navigation Pane. That has no effect on what is seen in the document, only on what is shown in the Navigation Pane. This is a feature designed into the Word program, itself. It is not a user option and you cannot turn it on or off. There is an option to always uncollapse this text when opening a document. This is a user, not a document setting. This is on this page only because the Outlining Tab has buttons and options dealing with "Master Documents." I repeat: Do not touch these without reading my page on the Master Documents "Feature". Note: The idea of labeling of sections as "big ideas" was stolen directly from Bill Coan's article on page numbering. See information about copy permission. 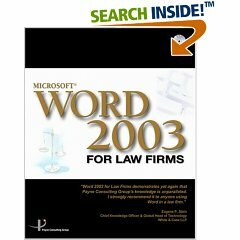 Search Intermediate Users Guide to Microsoft Word Using Google My office page as a Madison, Wisconsin Criminal Defense Lawyer. A note about link exchanges. This site does not participate in link exchanges to build web presence. If you have a link that you think would be of use to people reading this page, please send it to the webmaster with the url of the page where you think it should appear and it will be considered. Your placing a link to this site will not affect the decision on whether to add your link, though.